The musical NICK & NORA opened on Broadway on December 8, 1991, and closed on December 15, 1991. It only lasted 9 performances. 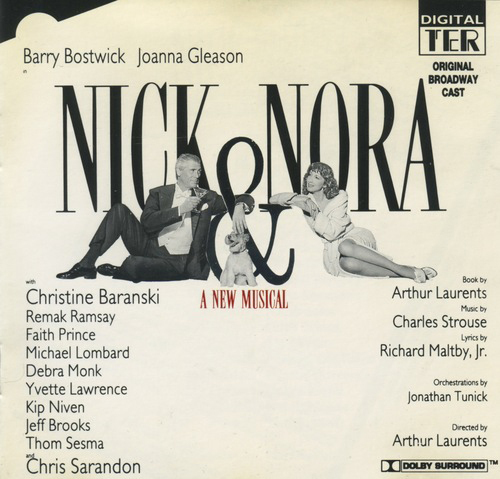 Even so, it got a Tony Award nomination for Best Original Score, Music by Charles Strouse and Lyrics by Richard Maltby Jr., and someone had the good idea of releasing the score on CD. I don’t know how it worked on stage, but there’s plenty to enjoy in the cast recording. Among the songs, there’s one of my all time favorites, “Everybody’s Wants to Do a Musical”, sung with gusto by a terrific Christine Baranksi, in what I believe is her musical theatre debut. In the leading roles, Barry Bostwick & Joanna Gleason, sound just swell and had a good time with songs like “Is There Anything Better Than Dancing” and “As Long As You’re Happy”. Also in the cast there’s Faith Prince, who strongly delivers “Men”, Debra Monk with the funny “People Get Hurt”, Chris Sarandon doesn’t sound bad with the ballad “Class” and Yvette Lawrence gives us a kind of out-of-place “Boom Chicka Boom”. As you can see, this had a really strong cast, but somehow (I read somewhere the problem was the book) it failed on Broadway and that’s a pity. Composer Charles Strouse score (his last for Broadway, at least until now) deserves to be discovered. His songs are melodious and catchy, with excellent orchestrations by Jonathan Tunick, and the lyrics by Maltby Jr are very character oriented and funny. Besides “Everybody’s Wants to Do a Musical”, I’m very fond of “Busy Night at Lorraine’s”, where the entire cast reveals their feelings for the murdered Lorraine (Faith Prince’s character). So forget all about this show detractors and give the cast recording a chance. You may get a nice surprise.